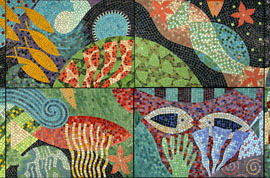 Unicorn Art Studio artists and designers create contemporary art mosaics in variety of techniques and materials for both, commercial and residential settings. 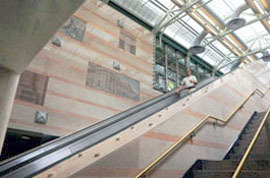 Their mosaic artwork is sited in mass transit stations, in the lobbies of commercial buildings, hospitals and schools, swimming pools, theaters and parks and numerous private residences. The studio accepts commissions to produce custom fine art mosaics, custom architectural mosaics and custom designed furniture mosaics. 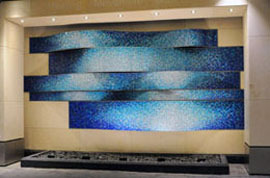 The services provided by the studio include design, fabrication and installation of custom, site-specific mosaics. 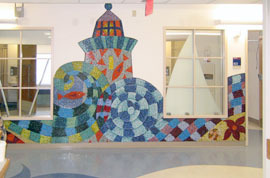 Following are selected custom mosaic artwork that the studio produced. Please click on images or links to see more information on projects. New York City Penn Station, “History Preserved”, Eleven Natural Stone Mosaics, New York City. 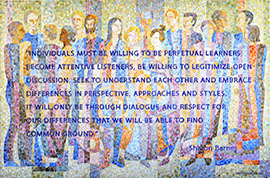 Mosaic “The People”, for Vanguard Group,Vanguard Head Quarters, at Valley Forge, Pennsylvania. 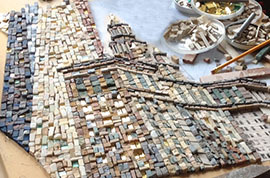 Mosaic in progress, 57th Street, New York City. 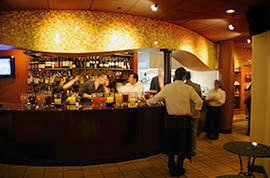 Mosaic “Western Sunset” for Restaurant Cactus Rose, Wilton, Connecticut. 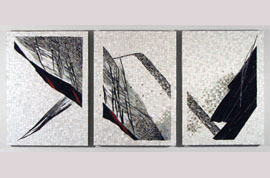 Mosaic “Moving Water”, for New York Hospital for Special Surgery, New York City. 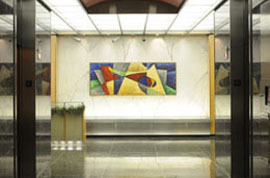 Mosaic "Abstract Composition" lobby of 529 Fifth Avenue, New York City. 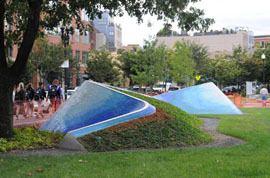 Land Wave,“Water Mosaic” for Peters Park, Boston, Massachusetts. 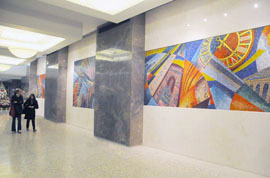 “New York City” Mosaic for Lobby of 1430 Broadway, New York City. 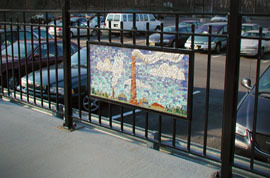 “54 Country Motives”, 54 Mosaics at Hazlet Rail Road Station, New Jersey Transit, Hazlet, New Jersey. 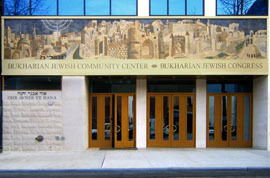 Exterior Wall Mosaic “Peace to Israel”, for Facade of Jewish Community Center, Forest Hills, Queens, New York. 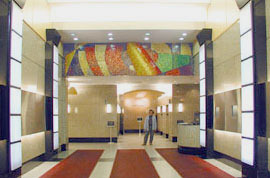 Mosaic for lobby of 575 Madison Avenue, New York City. 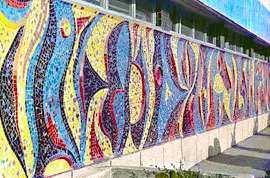 Exterior Wall Mosaic “Birds”, Boston, Massachusetts. 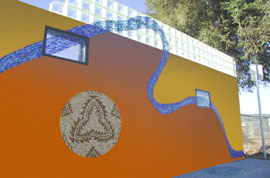 "Sacramento River” Mosaic and “Indian Baskets” Mosaics, on Sound Wall and Pavement, City of Chico, California. Mofaic for Childrens Clinic, Boston, Massachusetts. 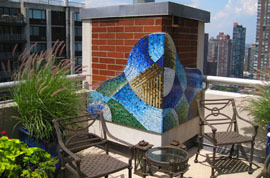 Exterior wall mosaics and fountain at Private Residence Penthouse, Midtown, New York City. 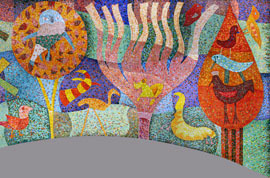 Mosaic for the Dana Farber Cancer Institute, Boston, Massachusetts. 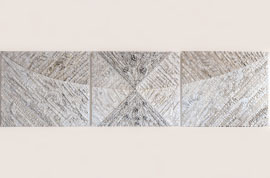 Mosaic "Bamboo in Snow" for Private Residence. Mosaic from series "Impressions in White"
Mosaic for Trade Center, former USSR. 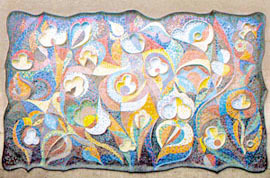 Mosaic for Kindergarden, former USSR. 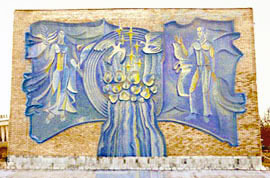 Mosaic for Cable Road, former USSR. 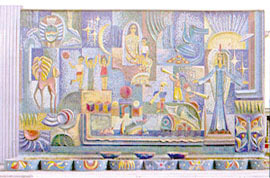 Mosaic for State Telecomunications Company, former USSR. 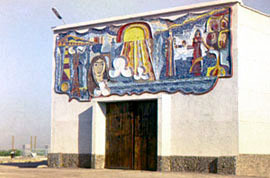 Mosaic for Water Station, former USSR. 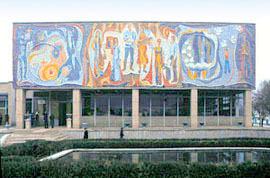 Mosaic for Cultural Center, former USSR.